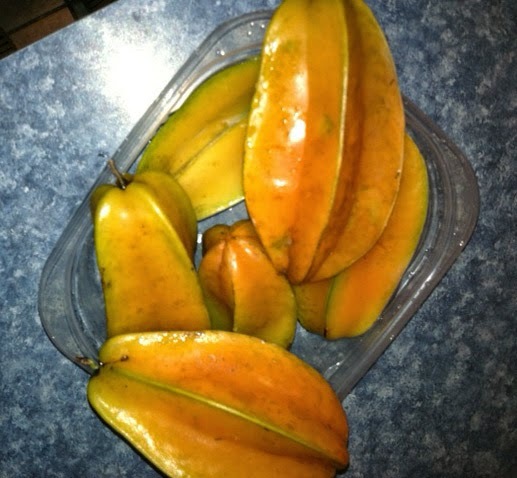 If you haven't had fresh, fully ripe starfruit, you're missing out! I purchased a dwarf variety of the carambola tree not expecting much. However, I have been pleasantly surprised by the little tree’s ability to produce. Not yet 4’ tall, but well over 40 star fruits this summer. Amazing. And really easy to grow (which is always a plus in my book). I didn't know there was a dwarf variety. That sounds like just my size. Our carambola trees were fruiting great and then a large flock of parrots came along and ATE THEM ALL! Now, we have to wait for the trees to fruit again. Apparently, parrots love carambola 'cause they do this just about every time the trees bear. I remember those parrots wreaking havoc. Lovely trees with shattered fruit everywhere.